Bob Nibarger and I are the recently appointed PB ambassadors for North Mecklenburg County in NC. About 18 months ago we moved with our wives to Bailey’s Glen. This new 55+ active adult community is in Cornelius, NC, about 20 minutes north of Charlotte. I was introduced to pickleball in Michigan after playing handball for about 40 years. Bob was the coach of a championship girls softball team and start playing pickleball shortly after moving to NC. We have worked together to foster the growth of pickleball both in our community and in the local area. We conduct group clinics and offer individual instruction. 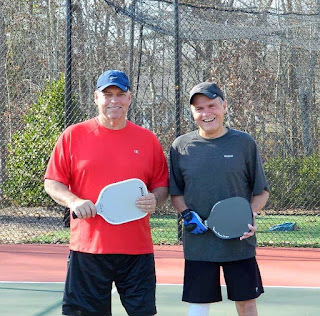 Bob worked with city officials to start a program offering pickleball for seniors in a school gym. Our first session had over 24 participants anxious to learn about our great sport! The growth we have seen in this area has been rewarding, and we are only at the beginning stage. We plan to offer many of the same promotional activities as we work to introduce pickleball into different venues and add additional courts.